Back when my daughter was just three years old, we drove by a horse farm on the way to our cottage. Eventually, we started stopping at the farm as the owner would let her sit on a pony, and I would walk her around the property. The first time we did this, the owner thought she wouldn’t even last 10 minutes, yet an hour and a half later I was still going around the farm! We continued visiting the farm, until they closed up (they’ve since reopened under new management), and her interest and love of horses has continued to this day. One day, last year she asked if we could go horseback riding somewhere in the city, and after some research, we found a small facility known as Claireville Ranch, located at the Claireville conservation area in Brampton. The ranch is located in a beautiful area, has about 25 horses and very pleasant and knowledgeable staff. The ranch provides pony rides for kids, trail rides, private trail rides, and riding lessons. The ranch doesn’t take reservations, but trail rides go out on the hour. An hour long trail ride costs $35.00 (however there are discount coupons online), which is one of the more inexpensive costs that I’ve come across. When I first discovered the place, my daughter wasn’t old enough to ride on her own, so I took her on a pony ride involving me once again walking her around the facility. Fast forward two years, and a few weeks ago, she asked if we could go back again. She’s older now, so she’s able to take a trail ride by going on a horse herself. Despite the beautiful weather and crowd on the weekends, when we got to the ranch, they had space for us on the next trail ride. After signing the waiver, being asked if we wanted to rent a helmet (I suggest this), and paying, we had a few minutes to hang around, grab a cold drink, and enjoy the area. Just before our hour was to begin, we were directed to our horses, the saddles were adjusted, and we headed out onto the trail. We had a leisurely ride and about midway through, one guide asked if we wanted to go faster. Unlike many trail rides which only go slow, we were allowed to gallop at a steady pace for a short time. During this recent visit, as well as our previous ones, the staff were all extremely friendly, polite, and knowledgeable, and perhaps most importantly….had safety as their primary concern. Our group of about 10 riders and two guides had a great time, and despite some sore muscles, I’m looking forward to going back again. After a quick stop at the snack bar, we were on our way back to our place, which wasn’t more than a half hour drive away. 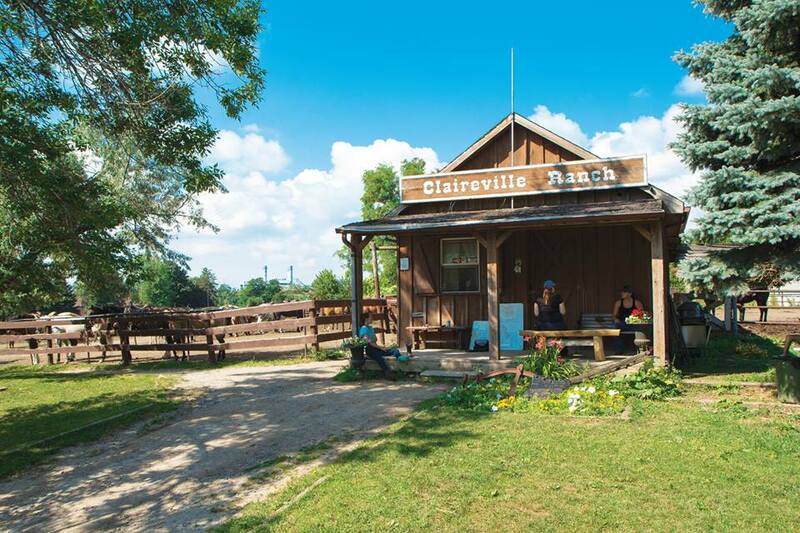 For a fun and relatively low-cost way to do something different in the city, consider visiting Claireville Ranch!